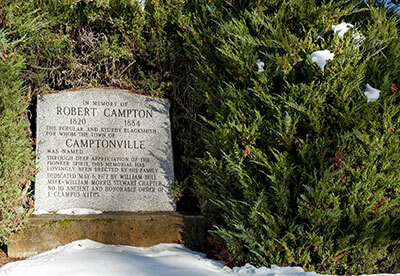 The popular and sturdy blacksmith for whom the town of Camptonville was named. Through deep appreciation of the pioneer spirit, this memorial has lovingly been erected by his family. Dedicated May 6, 1972 by William Bull Meek - William Morris Stewart Chapter No. 10 Ancient and Honorable Order of E Clampus Vitus.